One of my favorite places to find new jewelry designers is at Cameron Marks, a boutique in Santa Cruz. Owner Vanessa Ambrose has an impeccable eye for spotting original baubles that are distinct, feminine, and one-of-a-kind, like the brand Tiro Tiro, which is carried in Cameron Marks. We used the lower right bracelet in a recent fashion photo shoot we did for the blog, and that's when I discovered this remarkable brand. 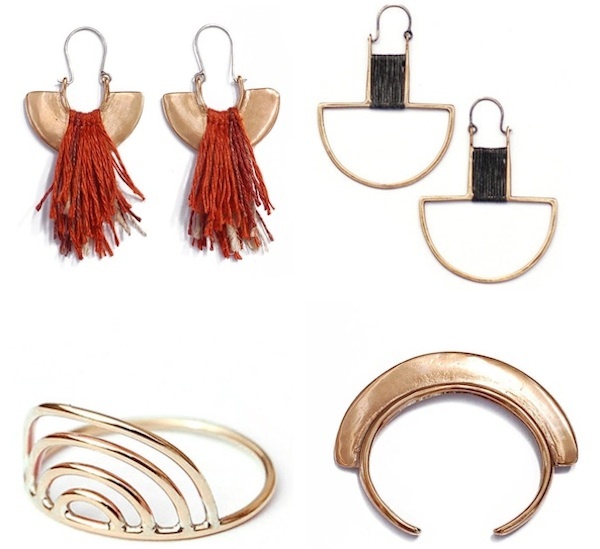 These are four of my favorites from the brand's exquisite collection: two pairs of earrings with woven linen, a sculptural gold ring, and the aforementioned remarkable bronze bracelet. The line is spearheaded by Oregon-based designer Teresa Robinson.